There’s no way I would be at 23 without her, There’s no way I would be at one without her. There’s no way I would be anything without her. She’s the only reason the Williams sisters exist. Serena about her sister Venus Williams. Traditional sources such as Valens, Dorotheus or Rhetorius agree in assigning the third place to siblings and in particular to brothers and sisters. Williams’ third place is in Sagittarius, its ruler is in the twelfth place, called Bad Daimon, in sign based conjunction with both malefics. This links her sisters to hidden enemies, trouble, depression, injuries or rivalries which are not openly carried out. The Lot of Fortune is in Williams’ third place, linking her luck to her sister(s), at the same time, the ruler of Fortune, Jupiter, is in the twelfth place. So while the sisters bring her luck, something about them is associated with disgrace. Counting from Fortune, Jupiter and both malefics happen to be in the tenth. So her career is to some extend connected with her sisters, but also trouble and difficulties due to the presence of both malefics in this place. Let’s go into that in more detail. Williams has Capricorn in her fourth place. 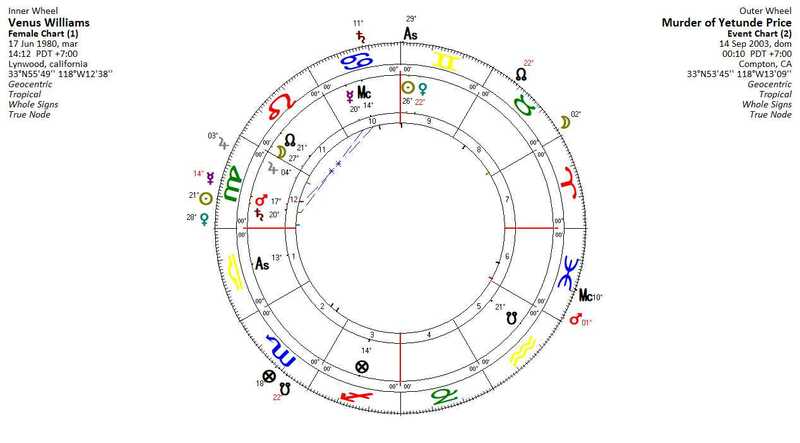 Its ruler is malefic Saturn, positioned in the twelfth place. The fact that the family had relocated to Compton was no accident. With its high rate of gang activity, Williams father had wanted to expose his daughters to the ugly possibilities of life “if they did not work hard and get an education.” In this setting, on courts that were riddled with potholes and sometimes missing nets, Venus and Serena cut their teeth on the game of tennis and the requirements for persevering in a tough climate. According to this quote, Williams father wanted their daughters to grow up in environments where gangs and dealers were common figures everywhere. 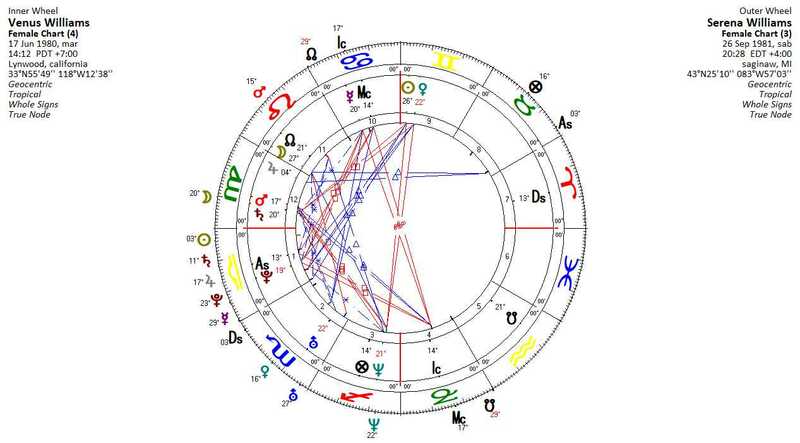 Whether this was an “inspired choice” (as he states) or just a necessity, Saturn conjunct Mars in the twelfth place together with the lord of the third place , describes the environment the sisters grew up. Interestingly, the third place also describes the religion one practices privately at home. The place is also called “the Goddess” and relates to the personal faith. Its ruler Jupiter being in the twelfth place together with the ruler of the fourth (family), makes this faith a hidden family issue, something which creates a distinction or else a separation from the others like a sect or a cult. All family members are witnesses of Jehova. It’s impossible not to feel that this fierce closeness of the Williams women,” the writer John Jeremiah Sullivan said of Venus, Serena and their mother, Oracene. “Strengthened by their shared faith, with its emphasis on separation from the world — has had not a little to do with the tremendous psychological stability Venus and Serena have demonstrated over the nearly 17 years of their careers. 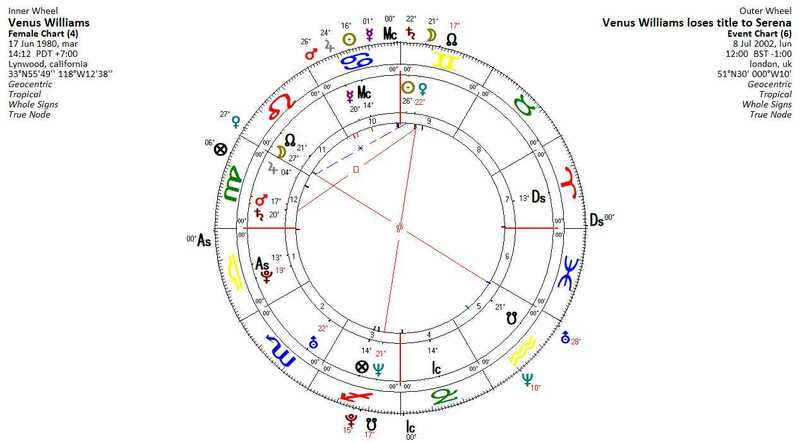 In order to study the details of the third – twelfth place connection in more depth, I will apply the traditional texts to Venus Williams’ chart and start with the Knowledge of the number of siblings. Count from the Degree of Mercury to the degree of Jupiter and add it to the AC. See how many planets are looking at this place: and he will have brothers [or sisters] according to that number. In Williams’s chart, the distance from Mercury to Jupiter in zodiacal order is 43°08’. Adding the degrees of the AC (13°32’) we get 56°40. Adding this to the 0° of the first place, we get to 26°40’ of Scorpio. 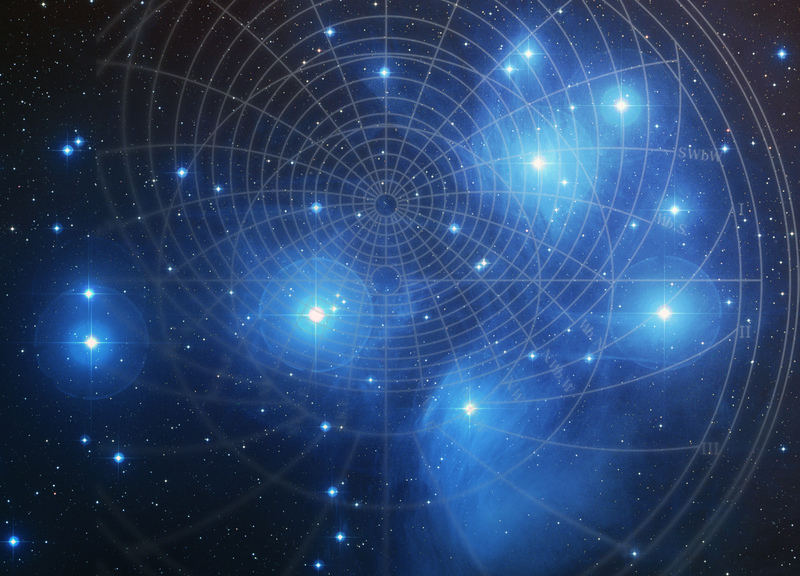 This sign is aspected by Mars and Saturn, Jupiter, Moon and Mercury and thus five planets. William has indeed four sisters and one brother. She has been born into a patchwork family, not all of her sisters are from the same father. Look at matter of siblings to the third sign from the AC. For if you have found it having two bodies or its Lord is in a sign having two bodies (lord in bicorporal Virgo) , then it indicates mixed siblings, the sons of concubines, from his father and his mother and someone besides her. Williams has the third place in Sagittarius, which is bicorporeal and its ruler Jupiter is in Virgo, another bicorporeal sign. Her sister Serena is the youngest of them and the only sister. The other three are half-sisters and do have a different father while the half-brother has a different mom. But now, how can we identify or distinguish these four sisters in Williams’ chart? 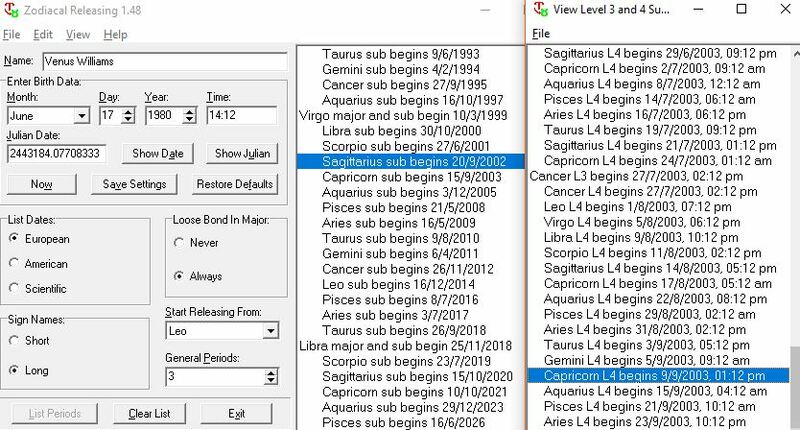 And look at the matters of siblings as I will mention it to you: Saturn and Sun indicate older brothers, Jupiter and Mars indicte middle brothers and the Moon the older sister and Venus the younger sister. Her younger sister Serena, is easily identified with Venus. (This absolutely matches Serena’s chart: she has a Libra Sun and the AC in Taurus). Her next older half-sister Isha Price is identified by the Moon. The next step is more difficult, as she does not have six sisters but only four. It seems to make most sense to associate the Sun with her next older sister half-Lyndrea Price while her oldest half-sister Yetunde is represented by Saturn. Her little brother, born only in 2013, seems to be identified with Mercury, since Jupiter indicates older brothers and Mercury naturally describes younger persons. The association of Saturn with Yetunde seems to make sense, because in Yetunde’s chart (noon time), her natal Saturn squares Williams’ Saturn and is conjunct Williams’ Venus, the natural significator of sisters. The Moon Mars conjunction between the sisters will become important important once we know what happend to Yetunde. Coming back to Williams’ horoscope, we see that Saturn is in his joy in the twelfth place. He strives with gang activities, all kind of illegal or hidden activities. Saturn is the malefic in sect and thus less harmful, and he is also peregrine, thus not having particular strength. Saturn describes accordingly Yetunde not as a gang leader but rather as a supporter, admirer or accomplice. Saturn is conjunct the malefic out of sect, Mars. 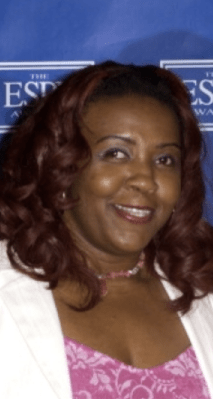 This links the gang activities to drugs, guns or similar and connects Williams sister Yetunde with marsian events and direct violence. [Yetunde] had not followed the family to Florida. From this we can see, that Yetunde had years long connections to several gangs, until she became a casual vicitim. She was non meant to be the target of the execution, which took place on September 14th, 2003. Her boyfriend, a member of the Bloods’ gang was supposed to die, but he remained unhurt. She died from a shot in her head. The association of Yetunde with Saturn in Williams chart becomes remarkable in the transit chart of the day of her death. Williams was in a twelfth place profection year and had her Jupiter return, so her third place ruler was activated. Jupiter is opposed by the malefic out of sect, Mars. Transiting Venus, general significator of sisters, and the eighth place ruler in Williams chart, is conjunct Williams’ Saturn (Yetunde). The derived eighth place from the natal third is in Cancer. On the day of the murder, the Moon happens to be in the natal eigth place, exalted. The Moon sextiles transit Mars , and trines transit Jupiter. Venus Lot of Fortune is in Sagittarius. 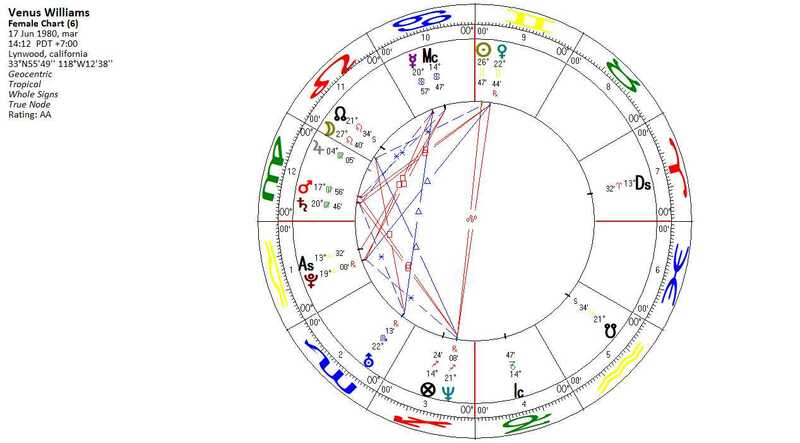 She has both malefics in the 10th from Fortune (the natal 12th) in an common sign. Thus all periods whihc activate a common sign (Gemini, Virgo, Sagittarius and Pisces) are difficult periods for her. The problem is, she also has both benefics in common signs. So there is always some salt in her soup when she wins, and never a total disaster when she loses. Cancer rules the eighth place from the third and is the place where Mercury, the ruler of the twelfth is located. Family issues, but the fourth place describes the end of things and the grave. Let’s now look at the relationship between Williams and her sister Serena. A quick glance at the sister’s biwheel explains their being struck together. 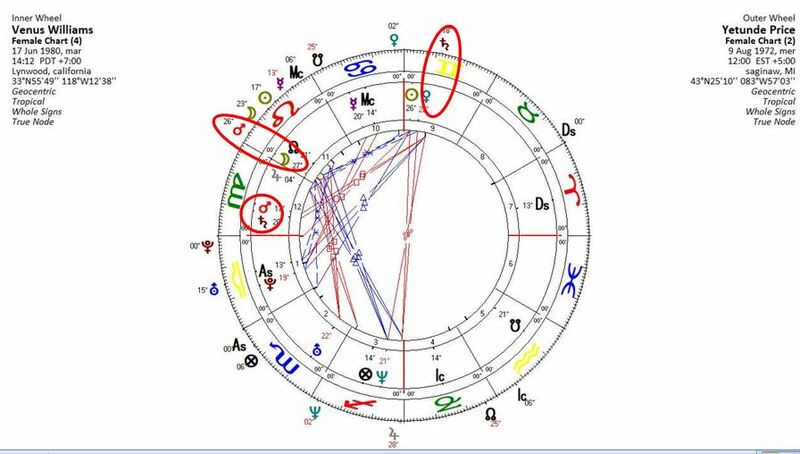 Serena has a Stellium in her sister Venus’ first place: Saturn repulses, and Jupiter attracts. The principle of magnetism. Both are professional athletes and we usually associate Mars with physical exercise. But contrary to what I was expecting, the sisters do not have any Sun or Mars related squares or oppositions in their synastry. Instead Mars and Moon exchange signs and both their Moons and Mars’ are in aversion. Nevertheless, Serena’s stellium with four out of seven (classical) planets squares William’s Mercury, while Serena’s Venus trines and her Moon sextiles it. So with the exception of Mars, all of Serena’s planets are linked to Williams’ Mercury. And only to Mercury. This intrigued me, since this seems to be the key point of the sister’s relationship. Interestingly, Valens associates games and sports with Mercury,  while there is no mention of Mars at this regard. While it is true that an athlete needs muscles (Mars), it is also known, that strength alone makes no sportsmen: thick muscles like those of a body builder actually prevent from moving. On the contrary, sports which aim to stretch and lengthen the muscles, such as Yoga, are usually not associated with Mars! Athletes need to be flexible, quick, moveable and agile as well as to concentrate and have the necessary intellect to focus on his/her personal targets. All this has to do with Mercury. Also, Mercury is associated with rhythm or, as Chris Brennan notes, rhythmic performance. We also should not forget, that Mercury rules in particular the arms and hands, fundamental for tennis players. From this point of view, Serena’s stellium square to Williams’ Mercury starts to make sense. Only one of them could win in the single competitions. And this must be a major issue between two sisters, even if they love each other. But there is more to it, when we turn nor to Williams chart. Mercury rules the twelfth place of hidden enemies in Williams chart and this hidden enemy is placed in Williams tenth place of career. Jupiter rules her sixth place and is in the twelfth so this might describe the Sjögren’s syndrome her autoimune disease, which caused her many struggle in her career: Williams had to fight against a hidden enemy in order to persue her career. Also, Mercury is in a water sign, so the “hidden problem” , her illness is linked to water. The Sjögren’s syndrome is a long-term autoimmune disease in which the moisture-producing glands of the body are affected. However, Mercury sextiles all the planets in Williams twelfth place and rises before them. This seems to represent her chance to get out of the twelfth place misery. Mercury not only rules the twelfth place, but also the ninth of higher instruction. In 2007 Williams had received her associate degree in fashion design and in 2015 her Bachelor’s degree in Business administration. Her sister Serena told the press that the intended to study medicine in order to help people, after having seen her sister’s struggle. However, Serena declared that she would do so only after having retired. Only Mercury has no companion and appears more independent than the others. No wonder, tennis is no teamgame. Williams has been ranking the Nr. 1 tennis player in the world, and after 20 years of career while I am writing this, she is still on place 9. Nevertheless, she made history together with her sister Serena, winning 22 titles when playing doubles together, including 14 Grand Slam titles and 3 Olympic gold medals. So Williams does not appear to be particularly suitable to play in doubles generally, she certainly is together with her sister, when they can unite their strengths. Then, Serena’s stellium in Williams first place squaring her natal Mercury adds incredible power to Williams. Together, they are invincible. On February 25th Williams was 21 years old. Looking at her annual profections we can see that her tenth place is activated. Jupiter had just entered this place and was in his exaltation. Mars trines her natal Moon and the Sun opposes Jupiter. The North Node is just between her natal Venus and the Sun, and transit Venus is in besiegement between the opposition of Mars and Saturn. The interesting point her is, that she still has to apply to Saturn. Only five months later, Williams loses her title to her sister. 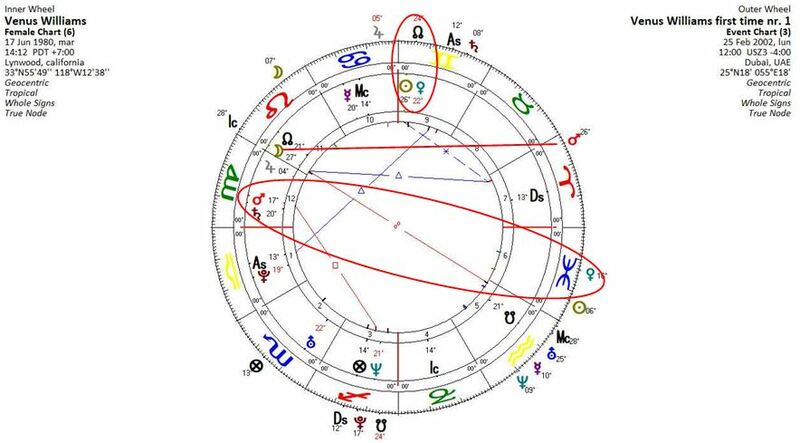 Now, previously besieged Venus (ruler of her eighth place of loss), is conjunct Williams Moon (success) and transiting Saturn (failure) is conjunct her natal Sun and transiting Moon (Success) is conjunct her natal Venus, (ruler of the 8th) and going to be “combust”. 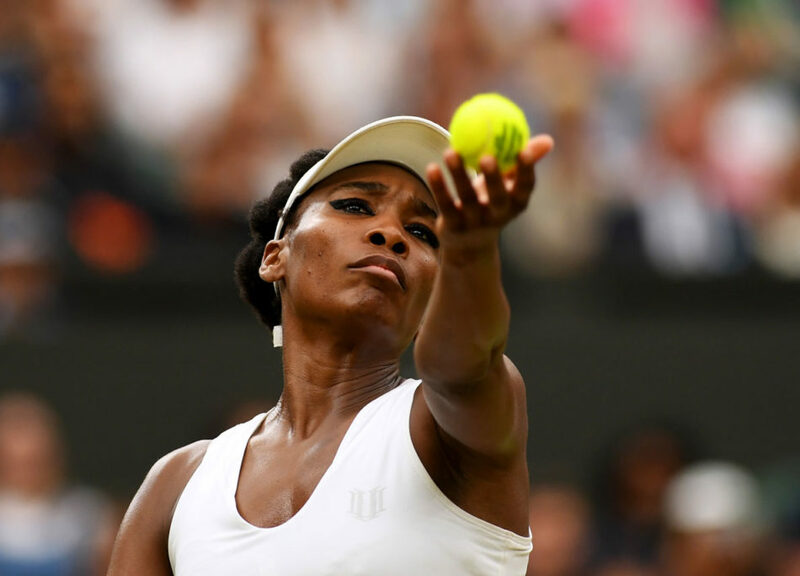 We have seen the Mars Saturn conjunction for Venus Williams sister Yetunde. I wonder how the Venus combustion will play out for Serena. I’d look at Jupiter in Virgo in the 12th harming the ruler of the Ascendant.